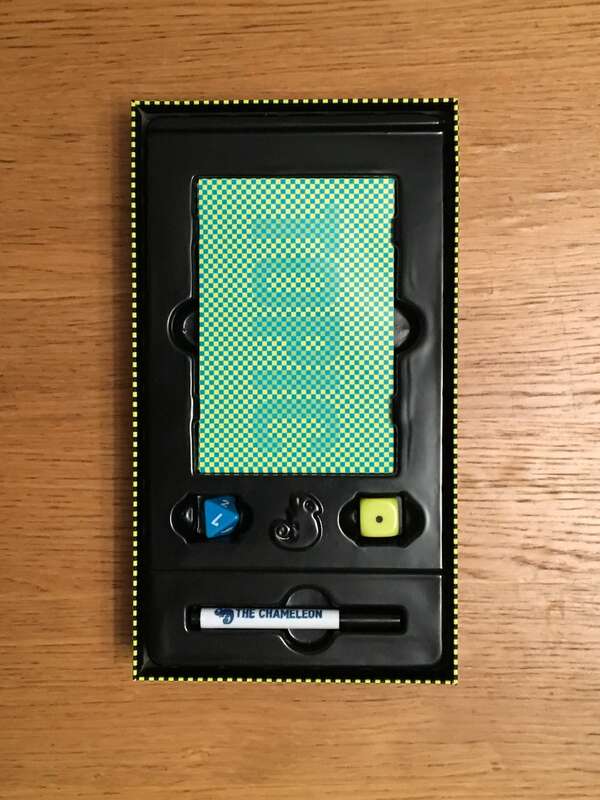 If you’ve played bluffing games before, you’ll be familiar with Chameleon, but what makes this game unusual is how it merges a demanding element of general knowledge with the fun and frolics of a party game. A challenging game for players who like things a little bit thinky, Chameleon may be one of the most unique experiences on your gaming shelf. Read on to find out more. Chameleon is a relatively simple game which comes in a slightly oversized but nonetheless beautiful and eye-catching box. 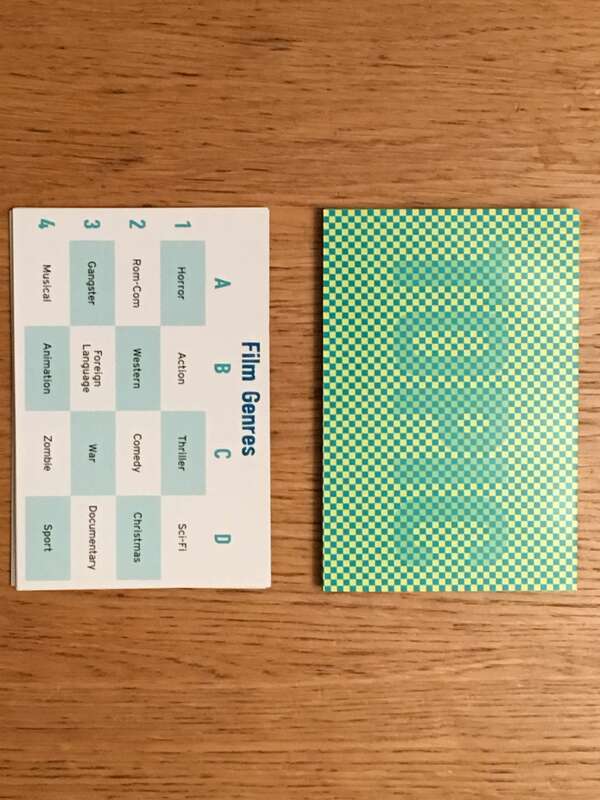 Within it you’ll find a large stack of what the game calls Topic Cards, each of which is a large card with a grid on it, filled with words that focus on a particular topic such as musicals, sports or movies. 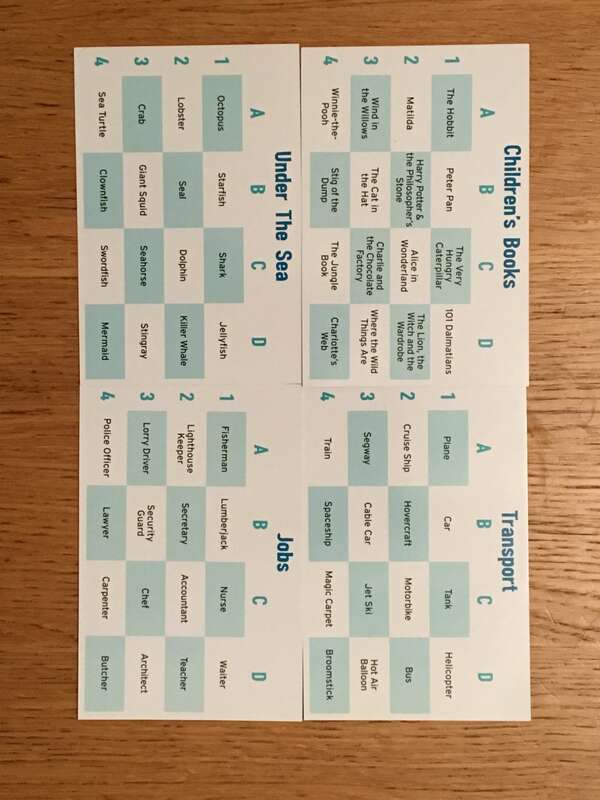 You’ll also find one supersized, wipe-clean card, with a blank grid and a pen, for the users to populate with any topic they like. In addition to the topics, you’ll also find two sets of player cards in blue and green. Among each set of cards is a chameleon card and seven cards that show a grid of possible outcomes, depending on the roll of two dice, which are also included. The dice themselves are fairly unique and come in blue and luminous green, which is a pleasant level of attention to detail. That, aside from essentials like the instruction booklet, is pretty much it when it comes to Chameleon. The rulebook is fairly brief, as the game is relatively simple and quite straightforward to pick up and play. It’s highly unlikely that you’ll ever need to refer back to it having read it once — it’s extremely easy to remember and teach for future plays. As I said, Chameleon is an unusual mix of bluffing game and general knowledge quiz. Every game begins by drawing a topic and placing it face up on the table. 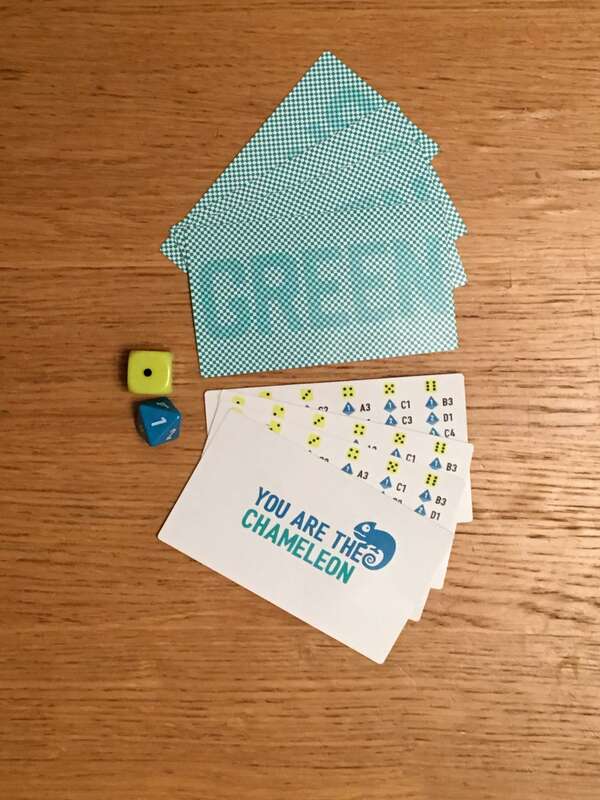 Each player is dealt a card from either the blue or the green deck, with whoever sets up the game making sure to have shuffled the one chameleon card in with the rest. The chameleon will be attempting to blend in, whilst everyone else will be working to expose them. How does that happen? I imagine you must be wondering. Well, everyone except the chameleon has a grid on their card, which relates to the outcome of the blue and green dice, which they now roll. 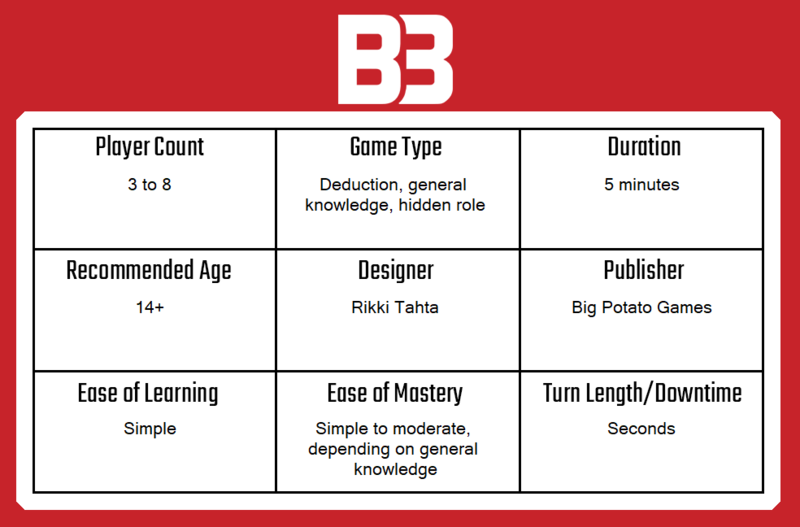 Take those dice rolls, compare their outcome to your card and you’ll have an answer like A2. The non-chameleon players now silently assess A2 on the topic card and think about what they’ll say about it. The chameleon will think about how to say something that might relate to the secret word, without knowing what it actually is. As an example, A2 points to ‘The Lord of the Rings’ on the movies topic board. The first player might say ‘very long’ whilst the second might say ‘you shall not pass’. The third player, who is the chameleon, may or may not have realised that among all the movies on the topic board, the other players are talking about Lord of the Rings. In that case, they might say ‘Legolas’ and on play goes like this until everyone has made a statement. At the end of the round, the players must now discuss who they think the chameleon is and in this case, they have a good chance of escaping capture. In a more complex example where the chameleon doesn’t know the film (which is sometimes because they are the first player to act), they’ll need to make a more generic statement. Sometimes, the players don’t know much about the secret word either — which can result in equally vague answers. It’s the latter point which most often introduces uncertainty about who the chameleon is. Even if discovered, the chameleon can always escape if they can guess the hidden word, so there is an impetus for non-chameleon players to avoid being too obvious. Chameleon is quite a unique take on the hidden-role or deduction genre in that it introduces a fairly complex/challenging method of determining the chameleon. Some of the topics are, probably, more obvious than others (movies or sports are good examples) but others depend very much on your knowledge of the topic and the keyword the dice determine. The randomised nature of who becomes the chameleon is essential to ensure that no one knows who they are ahead of the round, but it can also result in that player acting first, which I think commonly results in a fairly obvious outcome. Chameleon is exponentially better at masking this weakness as the player count increases because each new person increases the chance of a vague or random answer that might throw the other players off the scent of an otherwise obvious chameleon. With edge cases like not knowing the topic or an obvious chameleon acting early in the round, the average outcome of each game of Chameleon is a lot of fun. Probably about seventy to eighty percent of games work the way they are supposed to, with a decent showing from the non-chameleons and a chameleon that is at least able to make a broadly sensible attempt to hide. In these cases, the debate that follows a round of guesses will result in accusations, cajoling, banter and a lot of laughs — which is exactly what a party game should be all about. On the flip side, if the game falls flat several times in a row, it can quickly become difficult to keep the group focused on continuing to play. When a game of Chameleon goes well, it really, really goes well. It can be tough, tense and exciting. At the same time, each round only lasts two or three minutes at most. I don’t think it’s a competitive game of any kind, so there’s no real incentive to play it outside a party setting, though I guess you could introduce teams and other variants within your own set of house rules. Anyone can play, although I think the host would probably need to tailor the deck of topic cards for a young or otherwise niche audience — you might omit some topics if you know they will cause the game to fall flat with your group. On that note, whilst the highs in Chameleon are significant, the lows are a problem too, so it’s worth bearing that in mind when you make a purchase. Overall, Chameleon is a fun, unique and unusually challenging party game that really engages the brain on a couple of levels with bluffing, quick thinking and good general knowledge all called to the forefront of the players’ minds. A worthwhile addition to any shelf that expects to see play with five or more players often, I would say. A copy of Chameleon was provided for review purposes. You can find out more about Chameleon on the website of publisher Big Potato Games. Liberatores: The Conspiracy to Liberate Rome review — Hail, Caesar! Weird Things Humans Search For — Google drive?